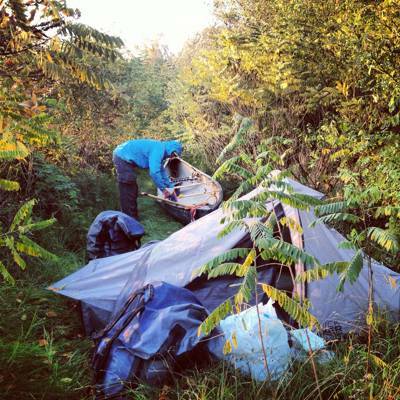 On 2nd July last year, I slid a shiny new canoe down a muddy riverbank, piled it high with camping gear and set forth onto France’s longest river, The Loire. Not only was it France’s longest river, but I was going the wrong way, and once I’d battled hundreds of miles upstream towards the source, I wouldn’t have finished my journey, in fact, I wouldn’t even have done 10%. Along with a friend, Nathan Wilkins, I was embarking on an adventure that had been two years in the making: to cross the entire continent of Europe by canoe, something that had never been done before. Our route was a twisting mix of European waterways, each one directly connected to the next, spanning a total distance of 3000 miles. From Nantes, in France, we were bound for Istanbul, Turkey, and when we set off on that bright July morning we had no idea what lay before us. The expedition spawned from a canoe trip I had done four years earlier in the wilderness of the Yukon, Northern Canada. In two weeks I encountered more bears than humans and was hooked on the primitive escapism of the journey. As my university years passed I read countless adventure books and, learning that it had never been done, I began mapping a route across Europe by rivers alone. Of course, Europe is in stark contrast to North America. While we had plenty of days in unadulterated river valleys, the majority of time we found ourselves paddling through settlements steeped in riverside history and diverse in culture. By the time we reached Istanbul we had canoed through ten different countries each offering something new and exciting. In fact, it was the regular encounters with local people that made for such a fascinating journey across Europe: from helping an Austrian man reel in the biggest fish I’ve ever seen, to watching Kung Fu Panda with the Romanian border police, brief moments out of the canoe offered a window into an ever-changing human landscape and a glimpse of places I will, mostly, never have the chance to see again. The opportunity to visit some of the most fascinating places in Europe did not come easy, of course. We were not flying around on night-trains with our fellow students. The expedition had all the trials and tribulations you would expect of a voyage that lasted five months: from the physical strain of upstream paddling across France, we progressed onto the Rhine, Europe’s busiest commercial river, where we dodged between 600ft tankers and crowded cruise liners touring the historic cities. From here we headed back upstream on the river Main, a German waterway that almost boxes the compass in a constant tangle of tight meanders. Through dark Bavarian forests and sloping vineyards, we merged onto an artificial canal that took us to the River Danube, our final waterway and the second longest river in Europe. We were living a nomadic lifestyle, guided in our direction by the natural landscape. The unknown became a simple formality, waking up each morning to head somewhere new and never being surprised if didn’t turn out as expected. On day 17 we had most of our gear stolen, on day 25 we capsized, on day 98 we were threatened by gypsies, on day 136 we were arrested by the Bulgarian Navy… just a few highlights from the endless list in my diary, perfect examples of what adventure is all about. Even taking in cultural capitals such as Strasbourg, Frankfurt, Vienna and Budapest the expedition was, at its heart, a wholly outdoors experience. Flitting through these cities in filthy clothes and muddy sandals, the workaday lifestyle of normal living seemed foreign and strange. Vibrant metropolises would hold our interest for a while, but we yearned to be back on the move or camping on the riverside amongst the trees, gradually changing shade as we headed into autumn. During the 146 nights of expedition, fewer than 20 were spent indoors and the efficiency of our camping set up was incredible. Over the course of nightly repetition we had become a well-oiled machine and from landing our canoe we could be eating a freshly cooked meal, beside the fully furnished tent, within twenty minutes. Almost a year on, I can picture most camping spots clearly in my mind. Unzipping the tent and stepping out onto our own private island in the middle of the river Danube, sitting around a campfire in the dark or washing in the bone-chilling river water. It was the most authentic camping experience imaginable and the freedom of the riverbanks, especially in Eastern Europe, was glorious. We stayed in our fair share of campsites too and even here the diversity was staggering. For example our summers night in Amboise, France, camping opposite the grand Château, with 300 electric pitches, wifi, a full time security guard and three shower blocks with full laundry facilities, can be compared with stumbling across a campsite in Golubac, Serbia where, in October, we shared the run down women’s toilets with the two other campers and shooed a stray dog from our tent at bedtime. Notable favourites from those sites we stayed at were Camping Du Lac, in the tiny French village of Palinges, where I ate the best steak of my life, hands down. Situated on the edge of a small lake, perfect for swimming, the owners were friendly and helpful, giving us a lift to the nearest town where we could do our weekly food shop. Similarly, Camping Au An Der Donau in Austria was a pleasant riverside campsite that won us over with a friendly owner. Impressed by what we were up to, he offered to drive us to local sights and let us camp for free, smoothly done by surprising us with a fully printed invoice with a 100% discount rate. In Passau, Germany we camped a short walk from the city centre in a quaint, tent-only, campsite. The picturesque spot, alongside the river Ilz, was occupied by like-minded travellers following the Danube River Bike Trail and has a very simple charm, despite continuous rain. Finally, worth a mention was the awesome location of our campsite in Budapest, Hungary. Despite the arduous and slightly audacious carry of our canoe, which involved crossing a busy train line, the campsite is a kilometre from the river and right in the city. There’s a metro station around the corner, but the city centre is actually just a 20-minute walk away. Whether in the heart of Budapest or on a muddy island, camping was an aspect of expedition routine that, like everything else, was a constant journey. In Romania we slept with sticks as the howl of dogs echoed across the Danube valley, a far cry from our early days in France where, exhausted, we slept to the sound of children still playing in the evening heat. Wherever we camped, the next day we’d quietly pack our things and drift back onto the river, leaving nothing but a small imprint on the ground, a relic of our brief existence in that place. By nightfall we’d be pitching our tent further across Europe, equally exhausted but equally contented and, as always, bound for Istanbul. By James Warner Smith. May 2014.